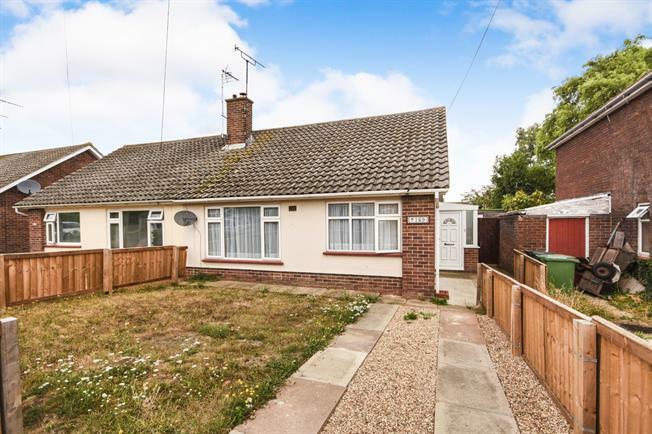 2 Bedroom Semi Detached Bungalow For Sale in Witham for Asking Price £250,000. A two bedroom semi-detached bungalow located in the Maltings Lane area. The property sits on a generous plot with its large rear garden and a driveway to the front. Accommodation consists of a lounge with multi fuel burner, modern fitted kitchen, master bedroom with a built in wardrobe, wet room and a rear lobby. Offered in good decorative order. Entrance door to porch, double glazed window to side, door to hallway. Textured ceiling, loft access, radiator, storage cupboard. Textured ceiling, double glazed window to front, radiator, multi fuel burner. Smooth ceiling, range of wall mounted units, roll edge work top surfaces with base units and drawers under, stainless steel drainer sink with mixer tap, space for kitchen and domestic appliances. Smooth ceiling, double glazed window and door to side, space for kitchen appliances. Textured ceiling, built in wardrobe, double glazed window to front, radiator. Textured ceiling, double glazed window to rear, airing cupboard. Smooth ceiling with extractor fan, double glazed obscure window to rear, wall mounted electric shower, low level wc, wash hand basin with mixer tap and vanity cupboard under, radiator, tiled. The front of the property has a driveway providing off road parking. The large rear garden commences with patio areas, the remainder being laid to lawn with shrub borders.